What to know about stamped concrete in L.A. This driveway at a home in L.A. exhibits some of the most popular attributes of stamped concrete. Its pattern is Ashlar stone, a design that complements a variety of styles and is commonly used. Stamped patterns in L.A. range from the ultra-modern sleek, texture-only patterns to stone-looking patterns that complement some of the well-established homes in the area. This driveway also displays a neutral and nature-inspired color theme. In Los Angeles, stamped concrete is usually chosen to complement the home or business' architecture, rather than to be the focal point. 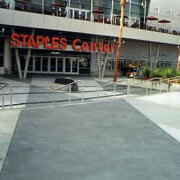 Who is installing stamped concrete in L.A. Experienced stamped concrete installers usually have an eye for the artistic side of things as well as the techniques needed to pour good quality concrete. Los Angeles is a hub for some of the best installers in the nation where their skills are put to work on expansive hotels and buildings and in both modest and elaborate homes. For example, stamped concrete was provided for the East Side Light Rail Project spanning from East Los Angeles to downtown. Various concrete techniques have also been used to craft creative work for Home Depot's national training center in Carson, the Cathedral of Our Lady of Angels in Los Angeles, Pershing Square in Los Angeles, the Antelope Valley courthouse, The Hyatt Huntington Beach Resort & Spa, the Santa Ana Zoo, and Saint Sophia Greek Orthodox Church in Los Angeles. 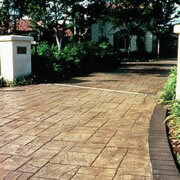 Stamped concrete has tremendous value, and it is most noticed for its longevity and cost effectiveness. Many homeowners and business owners in the Los Angeles area like the look of stone, but it's just not feasible in many cases to cover large expanses with hand-laid stone. Stamped concrete can achieve very similar looks to high end materials, but that's not its only characteristic that makes it popular. Many people prefer stamped concrete because it can make an otherwise boring gray slab of concrete more unique. The nearly endless options for patterns, borders, etc. are useful to designers looking for something custom. 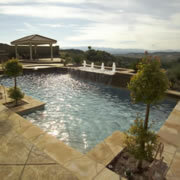 Concrete also does well in the California climate, making year-round installation easy to do.